Jean-Louis is a true master of Gamay. In addition to his masterful skill producing some of the best wines in the Beaujolais, he is also a local legend who seems to have a never-ending supply of saucisson that appears at apéros any time of day. Fleurie Lieux-dits La "Grand’Cour – Les Déduits"
From two parcels vinified together in the same tank, lieux-dits “La Grand’Cour” and “Les Déduits” on medium deep soil over the granite bedrock. As a result, single-vineyard cuvées were not possible. Vines mostly around 40 years old with 1.5 hectares of 80 years old vines average for "La grand'cour" and on the east face, “Les Déduits”, 3.5 hectares of 50 years old vines. Vinification in concrete tanks and put in oak barrels for 6 months. From a clay-limestone terroir with deep soils on East part of the appellation. 1.7 hectare, 60 years old vines. The vines have due Southern exposure and the highest are at 230m altitude. Vinification in concrete tanks and ageing 60% in stainless steel tanks and 40% in oak barrels for 6 months. 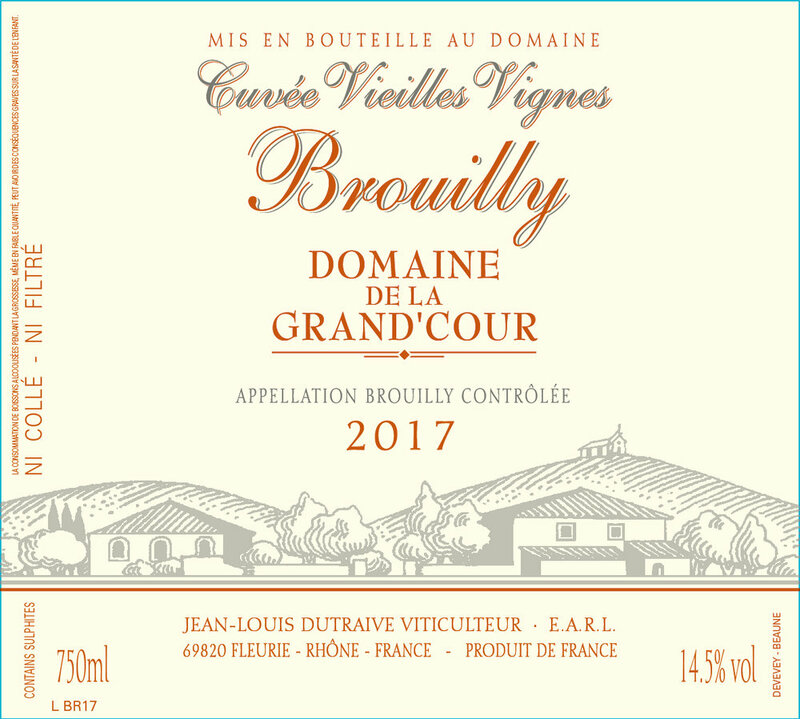 From grapes purchased from a single parcel in Fleurie, located at the northwest of the appellation and has granite terroir with very shallow soil. Vineyard very steep with southwest facing vines. Farmed conventionally. Vinification in concrete tanks and then aged in 60 hL oak foudres for 6 months.